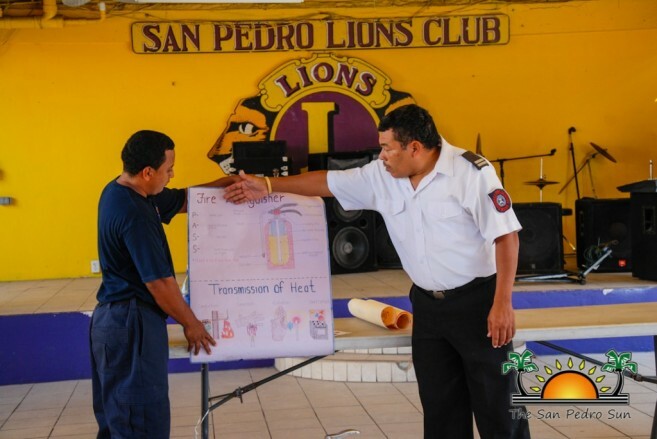 On Thursday December 18th, The San Pedro branch of The National Emergency Management Organization (NEMO) in collaboration with the San Pedro Fire Department, hosted a fire hazard training at the Lions Den. Organized by NEMO island coordinator Jeromey Timrose Augustine, the training saw a host of resort personnel, public health workers and traffic officers in attendance to learn the primary skills needed to prevent and control a fire disaster. Fires are often unpredictable disasters; however with added precaution, there are several measures that can be taken to reduce the risk. According to Fire Marshall and Officer in Charge of the San Pedro Fire Department Phillip Mencias, it is especially important to practice fire safety and prevention methods during the holiday season. Attendees were briefed about the several aspects of fire hazards, including how to safely transport LPG (Liquid Propane Gas) Butane, fire extinguisher training and Holiday Fire Safety Tips. 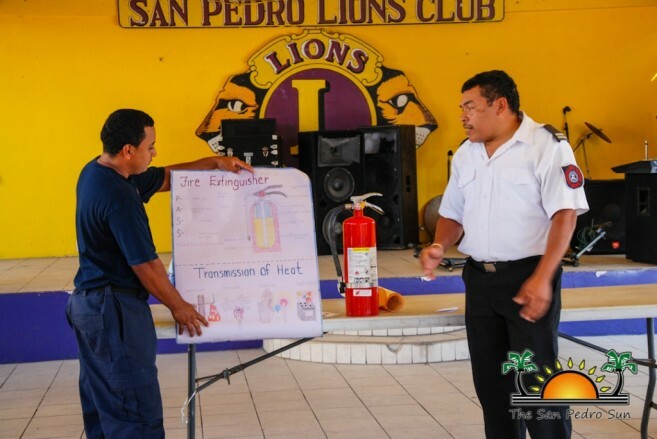 Accompanied by volunteer fire fighter Irvin Popper, Mencias discussed the significance of each business and household being equipped with a working fire extinguisher. He then went on to demonstrate how to operate the device. According to Mencias there are three easy methods to follow: starting with how to activate the extinguisher by pulling out the safety pin , one should aim at the base of the fire (not the flames) followed by squeezing the levers to release extinguishing agent. Lastly in a sweeping motion distribute the agent until flame is out. Once followed correctly, Mencias states that the steps should diminish a fire, however if flames grow out of control it is advised that individuals evacuate the premises and contact the fire department immediately. The fire marshals discussed an area of concern for many, the transportation of LPG Butane in supply quantities. According to Mencias the cylinder trucks transporting the LPG Butane should avoid doing so during daylight hours. The risk imposed if an accident were to occur would be quite substantial due to the large quantity of fuel and congested traffic. Therefore it is advised that these vehicles do so in the latter hours of the day, when traffic is less congested. The marshals then went on to their last topic for the presentation, which encompassed fire safety during the holidays. With added lights and synthetic decorations present around the holiday season the risk of electrical fires also increases. Mencias mentioned that it is important to avoid over loading electrical outlets, as these impose risk of electrical fires. It is also important to avoid placing Christmas trees and decorations too near to heat sources including decorative candles, as synthetic materials are highly flammable. The fire department reminds individuals to practice added caution over the holiday season by remembering to turn off ovens, unplug irons and monitor candles. NEMO’s last presentation for the year was well received, and response members and other interested parties are encouraged to attend the meetings in 2015. Happy and safe New Year to all!